I’ve been a big fan of Stephen Covey for quite some time now – just over 10 years. Mission statements, goals that serve that mission statement, putting first things first, 7 habits, and more. I religiously set and reviewed my goals every year to ensure that I was heading in the direction of my dreams. Career goals, number of clients, how much money I wanted to make, how often I wanted to exercise, how many dates to go on to find the right relationship . . . blah, blah, blah. They all appeared to serve my life and support my desires phenomenally well. That is until I realized that my life wasn’t working. Something was drastically missing. It all sounded and looked good, but the reality was 8 years ago when I once again embarked on the robotic misadventure to set my annual goals, my soul screamed at me. “This isn’t working! Why do you keep doing this! You are not happy and this is not giving you what your soul truly craves.” I was a bit shocked at the truth of this revelation, but the tears running down my face, and the frustration I felt throughout my body told me that my soul was right. So I took a deep breath, sat quietly, and just listened. What happened next was truly magical. My goals no longer fell under the typical categories of career, financial, lifestyle, and relationships, but rather the more esoteric, indefinable intentions titled spiritual, play, and connection. I felt as though my life was truly turned on its head. Structure disappeared, and in its place magic showed up. The next two years for me were nothing short of amazing. In some ways, I would even say unbelievable. I began to fulfill all my desires and a destiny I felt since I was a child. 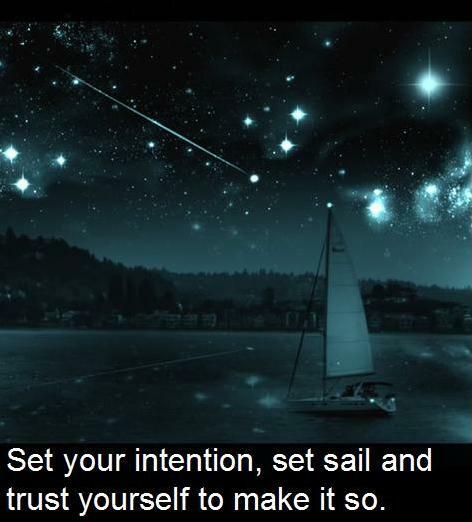 Hold an intention in your heart, give it some focus and attention, then watch the miracles appear. And that is what started showing up in my life. Miracle after amazing miracle – each more powerful than the one before it. As I distinguish it, a key difference between a goal and an intention is attachment. With goals, there is a basic belief that there is a logical path to follow, perhaps even a path that must be followed, if you are to get from point A to point B. In order to achieve X, I must do Y. Don’t get me wrong, to a large extent that works. It just doesn’t allow for the power of “flow” to show up – that mysterious energy that seems to oil all your efforts with a sense of ease as it brings you all you desire. With goals, we tend to be obsessed with following the steps and being in control in order to make things happen. Never have I known obsession or control to lead to a joyful life. With an intention however, that rigidly defined path disappears and is replaced by a sense of freedom and endless possibility. 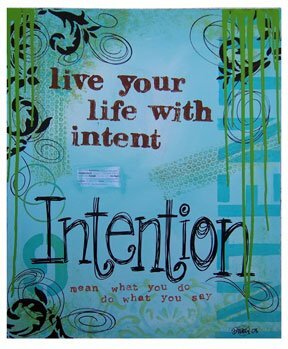 With intentions, you simply declare for yourself what it is you wish to create in your life, hold it in your heart and consciousness, and then let go and allow for the path to emerge. The great thing about this approach is that it allows for many more options to show up in your life, any one of which may lead you to the result you desire. Another key distinction between goals and intentions is that intentions eliminate judgment. With goals, we tend to set milestones and constantly measure and judge ourselves against them. If we meet them, we are successful. If we don’t, we are a failure. It’s hard enough that others judge us, and that we measure ourselves based on what our peers are doing. Do we really need to add the pressure of judging against ourselves? All this judgment eliminates the ability to be in flow; to connect with the Universe and allow the miracles to show up. With intention, there is no judgment, just inquiry. At the end of the year I ask myself 3 simple questions. 1) Did my intention come to fruition? 2) If not, I seek to understand why. How did the intention serve me? How did it not? 3) Do I want to carry any part of that intention forward into the next year? Without fail, I find that not only is my intention fulfilled, but due to the free, unattached, and non-judgmental approach I take, I always seem to achieve something I desired even more in my life, but did not know it at the time. Something of which I wasn’t even aware I longed for. And it is usually that hidden accomplishment that satisfies my heart, soul, and life more than anything I could have ever imagined.